The challenge of our generation is not finding inspiration or lack of amazing ideas to work on. It is the ability to stop, sit and Do the Work. Steven Pressfield in his latest manifesto Do the Work shows us a path to get the work done and in the end create art, and build businesses. Inspired by Pressfield’s book; over past couple of weeks, the members of The Domino Project street team got together to create an eBook and reached out to brilliant doers. 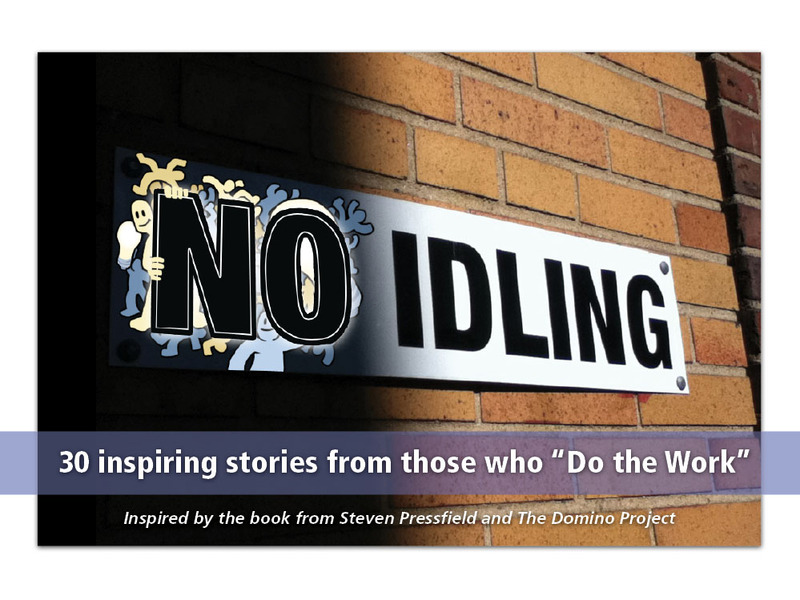 Thanks to some real hustling, we were able to do the work and ship “No Idling” – a collection of inspiring stories from 30 brilliant doers. You can download the free eBook right now. Read it in one sitting or save on your desktop and read one story each day of the month, choice is yours. Whatever you do you will not be disappointed. The book features entrepreneurs, top-selling authors, artists, uber-bloggers, internet talk show hosts and other brilliants doers. See for yourself who they are. Andrew Warner, who in his 20s created a 30+ million/ year (in sales) internet business and now inspires young entrepernurs at Mixergy.com. James Altucher, is a serial entrepreneur, author and an investor. He also writes one of my favorite blogs. Neil Patel, co-founder of 2 Internet companies: Crazy Egg and KISSmetrics. By the age of 21 not only was Neil named a top 100 blogger by Technorati, but he was also one of the top influencers on the web according to the Wall Street Journal. Michael Port, NYT best selling author of Book Yourself Solid and popular speaker. Carol Roth, best seling author of The Entrepreneur Equation. Anish Kapoor, is a British sculptor of Indian birth. In 1991 he won the prestigious Turner Prize. Get a glimpse of his latest creation in this story. Jayesh Sachdev, my good friend, is an artist par excellence. He holds the National Record for having painted India’s largest concept artwork and recently co-founded Quirk Box. Neil Pasricha, TED speaker and creator of 1000 awesome things. He is also an international best selling author. Charlie Gilkey, creator of Productive Flourishing and co-creator of Lift Off Retreat. David Siteman Garland, creator of The Rise To The Top; popular talk show featuring entertainers, athletes, newsmakers and other awesome people. He is also the author of Smarter, Faster, Cheaper. Marshall Ulrich, is an ultra-marathoner who has climbed all seven summits. At the age of 57, he completed his run across the United States, covering 3,063 miles in 52.5 days, averaging 60 miles a day. He is author of Running on Empty. Mark Silver is founder of Heart of Business. The eBook also features Arne Van Oosterom, Wendy Townley, Becky Blanton, John Rooks, Paul Durban, George Graves, Bob Poole, Jim Bouchard, Donna Mccarthy, Joel D Canfield, Bob Burg, Jackie Savi-Cannon, Kevin Brusie, William A Verdone, Steve Gordon Jr., Graham Lee Giovagnoli, Karl Staib, Kym Dakin, and Frank Mckinney. ps – shout out to Amber Rae, Dave Weinberg, Mollie Marti, Sachit Gupta, Megan Elizabeth Morris, Martin Whitmore, Jeff Slobotski, Rex Williams, Tyler Hurst and Debbie Weil, for igniting a spark, hustling and doing the work. I also want to thank YOU in advance for reading No Idling. Your mileage may wary; but do not shy away from sharing with those who may find it useful. So Go Go Go.. read it, use it, tweet about it or post it on Facebook. 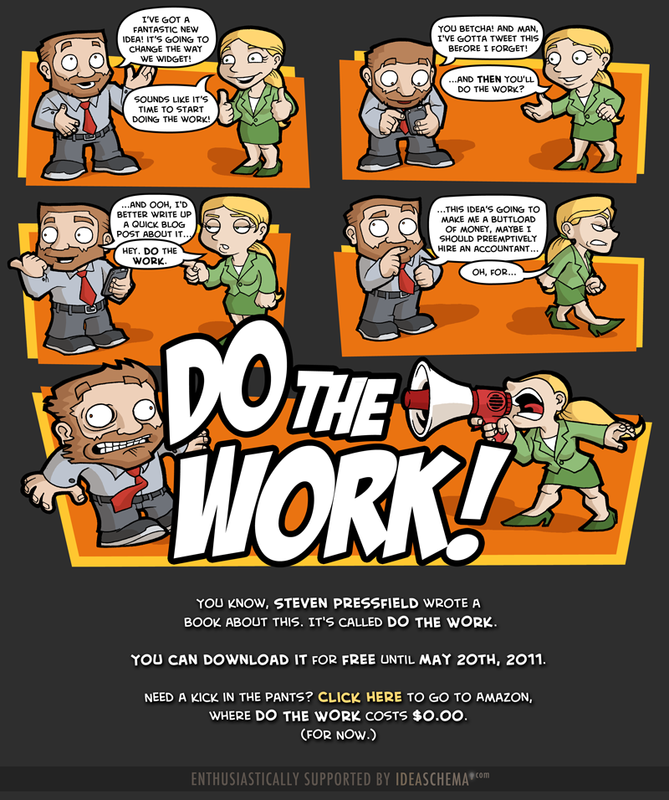 Update (17th May 2011): My friends at Ideaschema created this flyer to inspire everyone to Do the Work. Worth checking out and saving for a daily reminder. Mohit, thanks so much for the opportunity to share a bit of our story. After a lifetime of giving in to the Resistance, if we can help others slay the beast that’s A Good Thing, eh? Hey Joel. Loved your story. It is good to have a friend like Rex who was very particular about how we will write your name (without a period after D). Helping people find their why is a really worthwhile goal and an opportunity to find your own “why”. Wish you great success with http://findingwhy.com/ and joy and peace always. 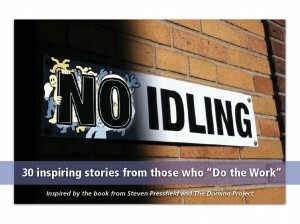 Pingback: No Idling – It’s Time to Do the Work. I love your stories especially Andrew Warner’s. Thank you so much for sharing. I am now more motivated than ever. Thanks Maria. Andrew’s story is amazing no doubt. Glad that you liked it. Stay motivated. Wish you an amazing life ahead. Next post How to actually make an impact?